to show them all on this page. They go on to make their owners proud (and to make them money!). At any given time we'll place a few here that we either really like, were particularly successful or have something interesting about them. Looking for examples specific to you industry or business type? Drop us a line for a full portfolio and a quick consultation. 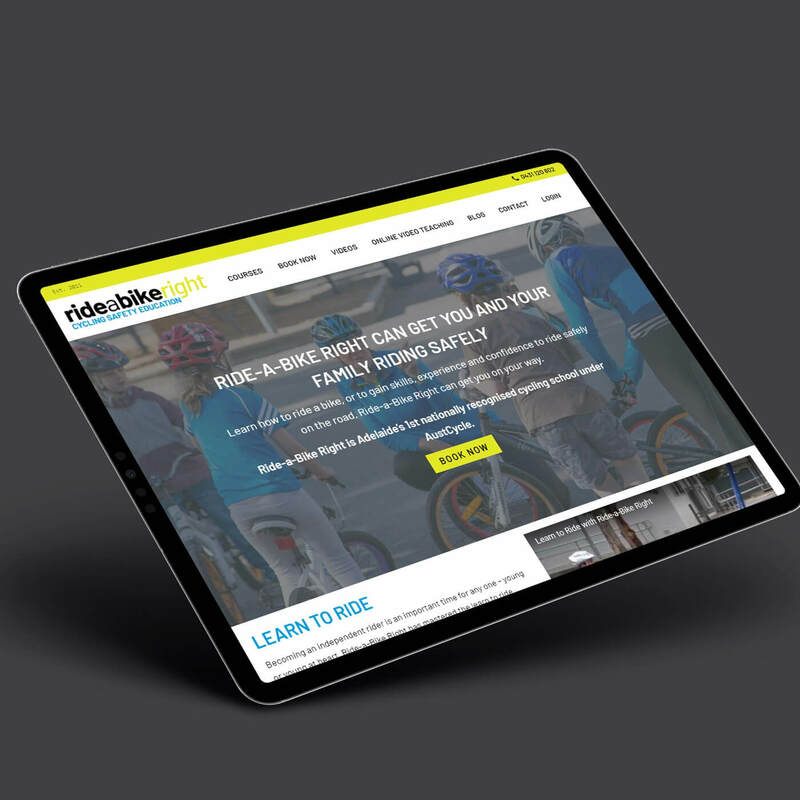 Offering courses in Adeleide, Australia, Ride-A-Bike Right is expanding into video tutorials and online courses to bring cycle safety education to more locations around the globe. We needed to show two different types of visitor the most relevant information for them. Locals need to have access to the details of in-person classes in Adeleide, the same classes that have always be taught, whereas web visitors from further afield need to be told about the online video tutorials. We found a balance between the two goals. We were also tasked with setting a new more modern tone with a fresh design, replacing branding from over a decade ago when the business was focussed much more towards classes specifically for children. The new look and feel doesn't take anything way from the goal of letting parents know that kids riding classes are available – but it will also appeal to adults too. Coach Jennifer Condolo's most recent project helps guide people towards living a more conscientious life. She offers workshops and personal sessions for this purpose. Through branding and a web design that is both calming and feminine, and a list-building website strategy built around offering samples of free guidance to turn leads into clients, Jennifer has been successful in growing this side of her business. She is now posed to begin offering online courses and workshops through a membership site. As a specialist concierge service, WJK needed a specific look and feel to attract high-end clients. We delivered a sophisticated design that is already getting results. For the target audience, we had to give careful consideration to designing a layout and site structure that didn't appear too cheap or salesy. We did this by filling the landing page with access to information about what the services entail. On these information pages, we then go on to display a main call-to-action button that takes the visitor, now with a proven interest, to another page which makes a sales pitch and registers the lead. Stan Campbell is known for his teaching experience as a law enforcement instructor and has personally trained over 4,000 uniformed officers and criminal justice professionals across the United States in the proper use of force, defensive tactics and how to de-escalate potentially violent encounters. He founded D.O.P.E. in response to the situation currently found in policing in the US. We built the website to aid Stan in founding a social movement. To do that, the website needed to lay out why he was uniquely positioned to lead such a movement and to start building up a list of supporters both in the general public and those working in law enforcement across the country. Carefully crafted opt-in forms help him build up that list for future use. Stan also teaches de-escalation techniques and speaks at events. Allowing interested parties to contact him was a secondary call-to-action. Stan's movement is growing swiftly thanks to being able to present his story and his ideas through his website. His informative and often heartfelt articles he posts in the blog have drawn in visitors. The Facebook commenting we implemented has made it easy these visitors to interact with Stan and with eachother. We love cupcakes and jumped at the chance to take on this project! Gina doesn't just make any cupcakes, she makes the super premium kind – gourmet ingredients leading to gourmet cupcakes. Gina came to us with a plan – she wanted a website that was better than any of her local competition. If she could outshine them in sales and marketing with a professionally designed platform, she'd draw in more (and higher paying) customers for her cupcakes. Repeat business would be secured because of the quality of the products – but that quality needed to be presented. For WhiteBox Bakery our plan was to just get out of the way, to let the cupcakes sell themselves. We built a photo-heavy catalog/portfolio type structure for the website so Gina could easily add and remove flavors, assign them to categories, add prices, etc. as needed. On every individual cupcake page you are bombarded with yet more flavors. They all lead to an order form. HISA is a 60 year old hydrochemical company who supply major South American-based mining, energy and argicultural companies with services relating to industrial-scale water treatment. This stunning website grabs visitors attention with a large looped video background of clean, natural running water covering most of the screen, drawing you in to find out more about the company and the industries they supply. The target visitor is often a lead who has already had contact with HISA and has been refered to the website to review technical documents related to specific services supplied to their industry. We made it easy to navigate to find the needed information, but with customizations to WordPress we also made it very easy for HISA to build up a library of tech specs and assign them to industries listed on the website. We don't get to do many hotel websites, so we jumped at the chance to implement this one for a 3-star hotel with a very high client turn over. The vast majority of their clients arrive pre-booked through partnerships with tour operators, but the hotel is keen to diversify and not over-depend on their exisitng partnerships. The hotel now wants to attract new customers using its website and we needed to define a strategy around doing this. As a hotel in a city, where of course the hotel itself is not the destination, we decided to market the hotel as the means to access attractions, focusing on the attractions and how easy it is to get to them from the hotel. Following on from this idea, we added a travel blog, where the hotel staff will add posts about recent cultural and tourist events. Not only does this serve as a means to promote the local attractions accesible from the hotel in more detail, but, we also creates the (correct) impression that the hotel staff are experts. Elizabeth Murphy offers life coaching for professional women. To capture new leads she offers a free consultation with the expectation that this will lead to the purchase of a monthly package. We decided that the main call-to-action ought to be a booking button taking visitors to a scheduling platform. With very few clicks, the complimentary consult is booked. The website also provides additional information about both Elizabeth and her services. A video on the home page and short to-the-point ‘about me’ page do this with little effort. Two additional pages for her main coaching packages also link directly to a scheduling platform. 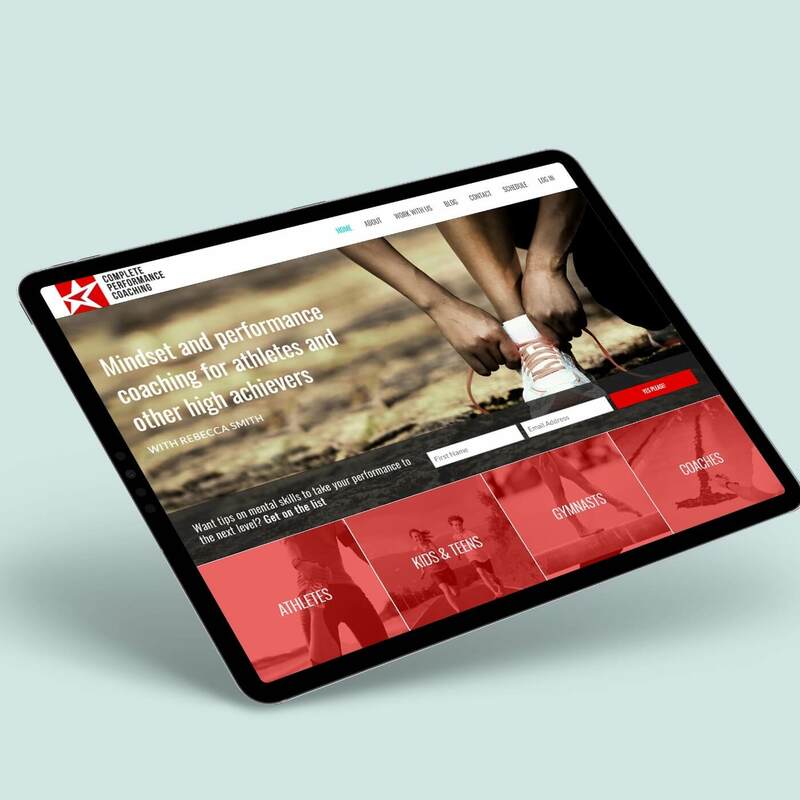 Complete Performance Coaching is a website for Rebecca Smith, a mindfulness coach who helps athletes and performers achieve their very best. Waqa Studios acted as a subcontractor to create a solid brand and a website that would draw attention. The final website pulls people in with strong visuals, draws people down the page to an opt-in form for client capture and then to category/client type keyword buttons that resonate with key visitor types. Looking great on all devices, the website turns heads with its distinctive branding, and achieves its aims with its functional design. We also developed the branding. The logo that represents action, confidence and strength. The star shape is reminiscent of a karate power pose with incorporated arrows that suggest movement and dynamism. The typeface is solid, strong and unmoving, counterbalancing the graphic element. Money matters, financial literacy is important. Zaptitude aims to improve financial literacy through its paid publications. To direct visitors towards our goal we'll rely heavily on our primary call-to-action:- a mailing list subscription with two freebies for signing up, weekly tips and tricks straight to subscribers inbox and importantly, the first two chapters of the main product for free. As well as the standard features included in every One Week Website package, extras added include a custom events area showing upcoming and and past appearances for finance geek and Zaptitide owner Peita. We also built a sales pages for the first and second book of the Finance Action Hero series. Take me to the reserve button!